Nonstick pans are cooking utensils manufactured out of materials to help prevent foods from burning or sticking to the pan during use. These types of pans are typically used for everyday cooking needs and reduce the necessity for nonstick spray. If you need to boil water in a nonstick pan, the process may take longer than normal as temperatures above 500 degrees Fahrenheit release toxic gases from the nonstick surface, warns Amanda Schaffer of Good Housekeeping. Boiling water in a nonstick pan requires more time than traditional pots and pans. Pour the desired amount of water into the nonstick pan. The more water you place in the pan, the longer it will take to boil. Put the pan onto your kitchen range heating element. Turn on the heating element for the kitchen range. Do not max out the heat; instead, set the temperature slightly above the medium setting. Wait until the water begins to boil. The amount of water placed in the nonstick pan will determine the exact amount of time it takes for the water to reach its boiling point. Remove from the heat or add ingredients based on the recipe you're preparing. 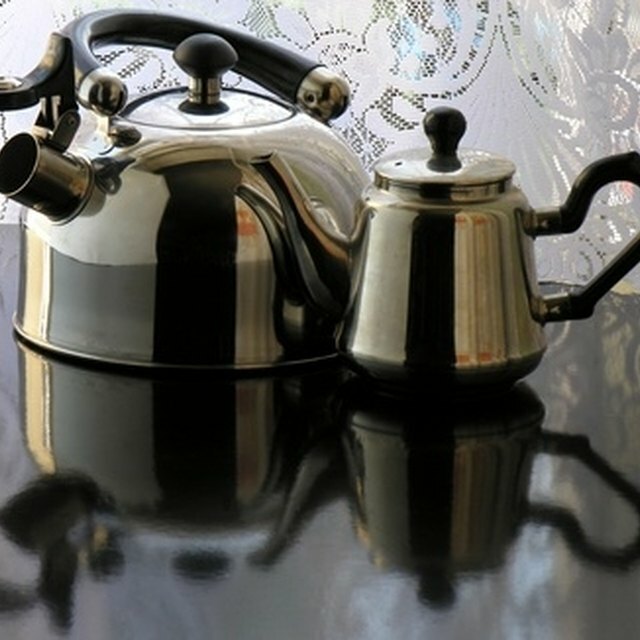 To swiftly boil water, use a traditional stainless steel pot as it does not feature temperature guidelines.